Choking can be a hazard for puppies, who are notorious for grabbing, tasting and chewing anything within reach. When a foreign object gets stuck in a puppy's throat or windpipe, it can become frantic as it tries to dislodge the object by gagging, retching, and coughing. It might also paw its mouth or rub its face against the ground. If the object blocks your puppy's airway, it may kill the pup. For example, a small toy can seal a puppy's windpipe like a cork in a bottle and cause suffocation. In this case, you’ll need first aid to save your puppy’s life. If you hear wheezing, air is getting through, but even a partial blockage may cause fainting. What Causes Choking in Puppies? 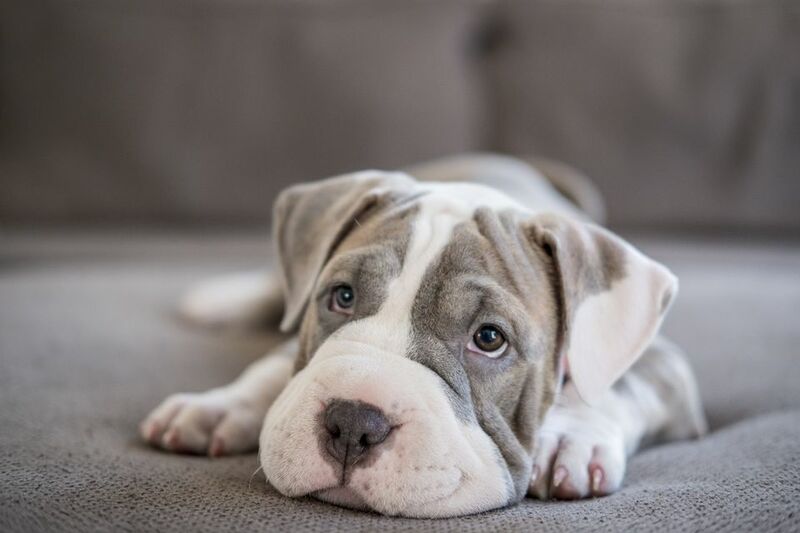 Aside from swallowing a foreign object, which many puppies try to do at some point in their lives, there are a few medical conditions that can cause choking or symptoms similar to those of choking. Puppy strangles, an autoimmune disease that causes swelling of the lymph nodes can cause choking or coughing if left untreated. Respiratory infections—often referred to by the catch-all term kennel cough—can cause a puppy's airway to become temporarily blocked, leading to coughing and choking. Don't delay treatment if your attempts to help your dog are unsuccessful—speed to the emergency room for help. And be careful: If you reach into your choking dog's mouth while it's still conscious, you're almost guaranteeing that the animal will bite you. Only reach into its mouth if the dog has lost consciousness. Restrain your puppy. You can’t help your dog if it's flailing around, and it may bite you out of panic when you try to look inside its mouth. Pull the dog's tongue to the side. Use a cloth to grip and move the tongue out of the way. This action may actually help dislodge the object. If possible, use tongs or needle-nose pliers to try to grasp the object (but not the tongue). Cut the stick/object. Sometimes chewed sticks or pieces of bone lodge across the roof of the mouth, and cutting the object in the middle with something like bolt cutters releases the pressure so it can be removed. Compress the chest. Gentle compressions on both sides of the pup’s chest (while it’s standing) may force enough air out to dislodge the object. Use the standing Heimlich maneuver. Puppies are shaped differently from people but the same principle applies. For a small pup, hold its back against your stomach (head up, paws down), and find the soft hollow under its ribs. Your closed fist should fit into this spot. Pull up and in two or three times toward your own tummy, using a thrusting motion. Use the kneeling Heimlich. If your pup is too big to lift, place it on its side and kneel behind its back. Place your closed fist in the hollow under its rib cage, and push upward and inward sharply, in the direction of the pup’s head and your knees. Remove the object once it jars loose. If it doesn’t, you can continue the Heimlich in the back seat of your car while somebody drives you to the vet clinic for help. Turn on the air conditioning. Since puppies stay cool by panting, ​when they choke on something and can’t breathe, they also have trouble staying cool. During the car ride to the vet, be sure you have the air conditioning blowing. It’s best to supervise playtime outside and puppy proof your home. For example, secure all garbage and trash cans and make sure any cleaning supplies are locked away where your puppy can't get to them. Basically any small item that doesn’t move faster than your dog does could be a choking hazard waiting to happen. Even if they don't produce choking, swallowed objects can prove to be dangerous if they cause an intestinal blockage rather than passing through and out in the stool. Don't give your dog bones or chew toys that fit totally inside its mouth (the temptation to swallow the item may be too strong). In most cases, getting rid of the obstruction allows the pup to begin breathing again on its own. But if it doesn’t, you may need to give your dog CPR to jump-start its respiration. Once the foreign object that choked your puppy is removed, there may be damage to the inside of its mouth or throat. This can take many days to heal and may also make it hard or painful for the puppy to eat its regular food. Soften your dog's normal diet by running it through the blender with warm water. It’s a good idea to have your puppy checked out by the veterinarian, even if your first aid manages to get rid of the choking hazard. Your puppy may have bitten its own tongue or the inside of its mouth, or the foreign object could have left abrasions. These injuries might require you to give your puppy medication to help prevent infection.